Researchers at MIT’s Self-Assembly Lab have recently developed an adaptable material that reacts in response to changes in heat. Known as Heat-Active Auxetics, the material functions in a similar manner to the pores on human skin, tightening and loosening based on exposure to various temperatures. Contrary to most common materials, which tend to thin out while being pulled or stretched, this technology expands in all directions instead and completely shrinks when compressed. This provides insulation in colder conditions and added airflow and ventilation when it is warmer, all depending on the material’s porosity. “Compared to traditional auxetic materials, heat-active auxetic materials demonstrate autonomous performance, environmental response, easy customization, and greater possibilities for the design and fabrication of material properties,” explains the Self-Assembly Lab. The self-awareness and responsiveness of auxetics is a result of certain programming, which alters the natural structure of a material by reorganizing it and controlling it through an additional variable energy source, such as temperature, moisture, light, and pressure. 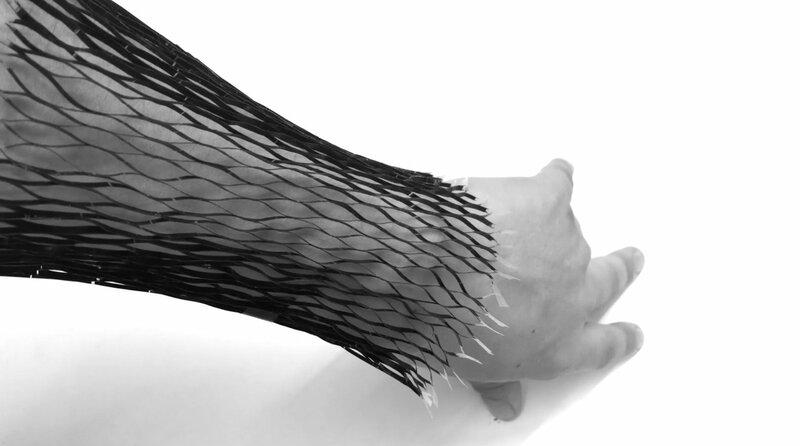 The research team, consisting of Athina Papadopoulou, Hannah Liendhard, Schendy Kernizan, Jared Laucks and headed by Skylar Tibbits, has already applied this programmatic methodology to other materials, including wood, carbon fibre, and leather. The team has also previously developed self-assembling flat-packed objects, such as shoes and coffee tables. The application of traditional auxetic materials ranges from packaging to body armor to sponge mops, due to their high energy absorption and fracture resistance. While the primary use of heat-active auxetic materials is envisioned to be in clothing design, it’s only a matter time before such responsive technologies find their way into architectural fabrication.